Above: Freshly harvested day lily tubers. They are best harvested in the spring before the plants grow too much or in the autumn after the plant has gone dormant. Although small, these are easy to collect and have a sweet, nutty flavor and starchy texture and can be eaten raw or cooked as you would other starchy roots. They grow on the ends or along a section of root and are easily cut using a knife or scissors. The roots are shallow and are easily lifted up in loamy soil. Many gardeners and plant enthusiasts who enjoy cultivating plants for their ornamental value may be surprised to learn that a great deal of popular and recognizable species are not only edible but delicious, nutritious and easy to care for. Intuitively, there are also a number of potentially deadly ornamentals such as monkshood (Acontium spp.) or the ever popular daffodil (Narcissus spp.) which could cause dizziness, staggering, cardiac paralysis, and/or numbing of the entire nervous system if consumed, so discretion is always a necessary precaution. Now that the growing season is undeniably underway, at least here in southern Ontario, I am out wandering and have already come across one common edible/ornamental duo-species that you may already be growing and not even know it. Whether you are growing it deliberately or have found it escaping into a local woodland, the day lily is the perfect first installment in the Edible Ornamentals series. The common day lily (Hemerocallis fulva) is a particularly hardy perennial that is not actually related to true lilies (Lilium spp.) at all. Day lilies belong to a completely different botanical family and grow very differently, although the flowers do strongly resemble those of true lilies to the casual observer. The plants have long, strap-like leaves with tapered, blunt ends, smooth edges, glossy surfaces, and emerge from the base of overlapping leaves. In early to mid-summer depending on your locality, the plants will send up long arching shoots which will terminate in a succession of flowers that are each open for a single day: slowly unfurling in the morning and fading the following evening. Fertilized flowers will develop into 1-2 inch long, 3-chambered spongy dry capsules which each hold a number of hard, shiny black seeds. Above: a nice healthy and vigorous patch of escaped day lilies growing upslope from a trail through an open woodland not more than two dozen meters from the closest backyard. Such extensive patches can easily be visited regularly at different times of the year and enjoyed. As always, areas too close to roads, railways, parking lots or derelict sites could contain various environmental contaminants and should be avoided. Common day lilies will grow well except under the most extreme conditions but prefer a rich, well-drained and uniformly moist soil and can be propagated by root division in spring or autumn or by seed. For the purpose of using the plant as an edible crop, I would advise relying on the straight species Hemerocallis fulva and avoid hybridized species or varieties which have been bred for show. Usually seedlings from these plants, if they produce viable seed at all, will lose the traits of their parents and revert back to the wild form, which is exclusively what I have seen growing in ‘unsupervised’ situations. Whether spread by careless gardeners who dispose of excess day lily plants by tossing them in a ravine or by the entirely unavoidable relocation of a few seeds from a plant someone forgot to deadhead, day lilies frequently invade sunny forest edges, floodplains, gravelly slopes or railway embankments and pathways along the edges of floodplains that happen to be surrounding urban or suburban development. However it happens, it is a forager’s dream. 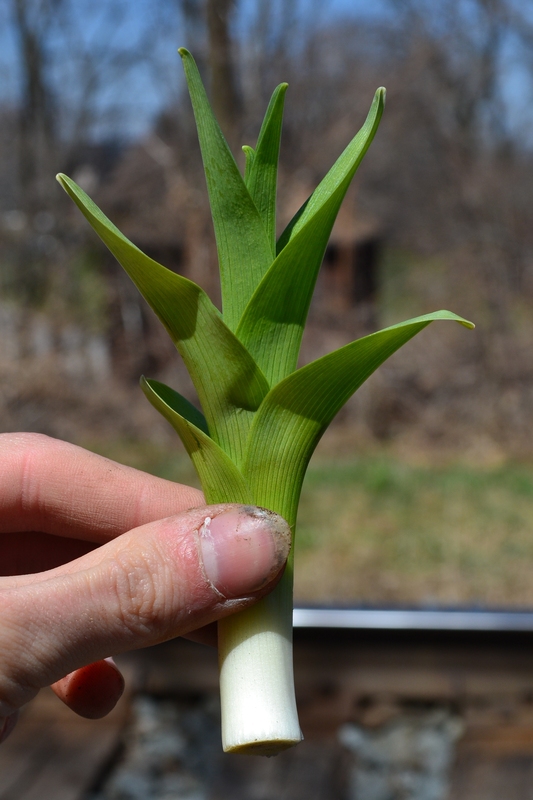 Above: a peeled and cleaned day lily shoot. By digging around where each shoot emerges from the ground and cutting several inches below the surface, the tender blanched part of the stem can also be collected. 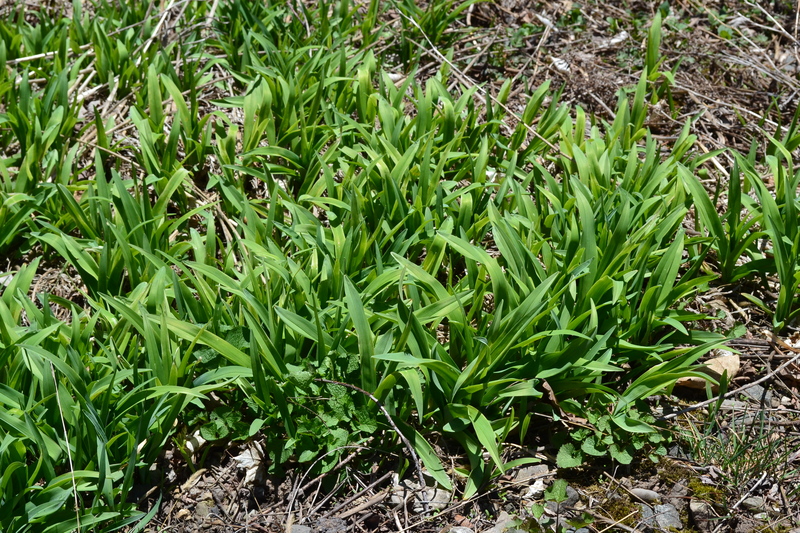 The leek-like shoots can be eaten raw, chopped into salads or sautéed. The flavor is bland but gently sweet, and the texture firm but slightly gel-like, similar to okra but not as pronounced, this feature being used to thicken soups and stews. Foliage quickly becomes tough and fibrous, so only spring shoots are preferred for eating. When left to their own devices, and having very few or no natural pests or diseases in North America, (day lilies are believed to have been native throughout Eurasia) these plants can spread like crazy, forming thick swaths that crowd out most other plants including other non-native invasives such as garlic mustard (Alliaria petiolata). They can grow in light shade as well as full sun, and can tolerate growing under walnut trees, brave considerable exposure and ignore harsh environmental contaminants. When in bloom, the patches are very hard to miss unless you are already trying to ignore them because you are starting to notice them all over the place. Despite their best intentions, day lilies are probably entirely absent in areas that are not close to residential areas and are therefore a luxury to foragers thats happen to frequent wild spaces near populated areas. Or, you grow them on your property and therefore have your own private collection. 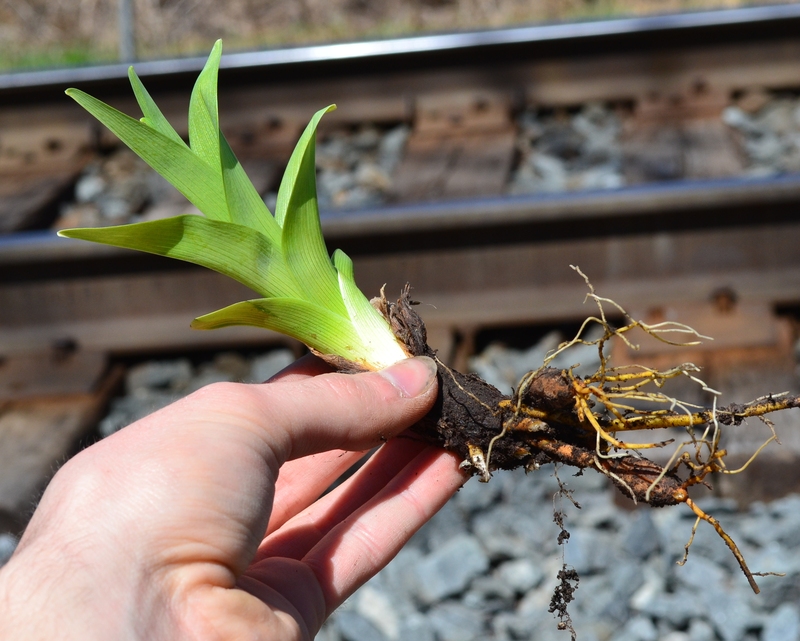 Above: A day lily shoot with some roots still attached. Patches of plants are easily separated, a feature which has helped the plant to spread as much as it has. Some small tubers can be seen growing from the roots. In spring, the shoots and tubers can be conveniently gathered at the same time. During the summer months, the young flower buds and petals can be eaten raw or cooked, and have a crisp, pea-like flavor. This patch was growing by a railway, which would not make a suitable harvesting location. So in conclusion, day lilies are quite the treat and definitely something worth knowing how to identify and appreciate, whether you are growing them for their ornamental splendor, for food, or for a different reason altogether. They invite the potential to be useful in every sense of the word, both for mind and body. I hold the opinion in the privacy of my own mind that day lilies could be cultivated as a food crop if someone were to try, to introduce another reliable and bountiful food plant into circulation, one that does not need to be replanted and already shows incredible resistance to disease, drought and other problems common to more conventional food crops. Diversity and is key, and it’s time that we understand the urgency that is involved in always having a secure source of food for ourselves and future generations.